In the previous post in this series we deployed vCenter, DNS, jump hosts and the pfSense virtual router appliance. In this post we are going to configure the pfSense virtual router. Again, like I have said previously, this is one way to do it, there are many permutations. Goal here is to get up and running asap. Nothing stopping you implementing a different way now or later. As can be seen above, pfSense has used DHCP on the WAN interface and got allocated an IP from my ISP provided router. We will change this to a static IP of our choosing by using menu option 2 and answering the prompts. Now we have a static IP configured on the WAN interface. We will configure the LAN interface later. Opening a browser to the WAN interface IP will fail as by default only access is granted via the LAN interface; firewall rules block access via the WAN interface. To overcome this, enter menu option 8 for shell access and run “pfctl -d” to temporarily disable the firewall. Now you should be able to access it via a browser. 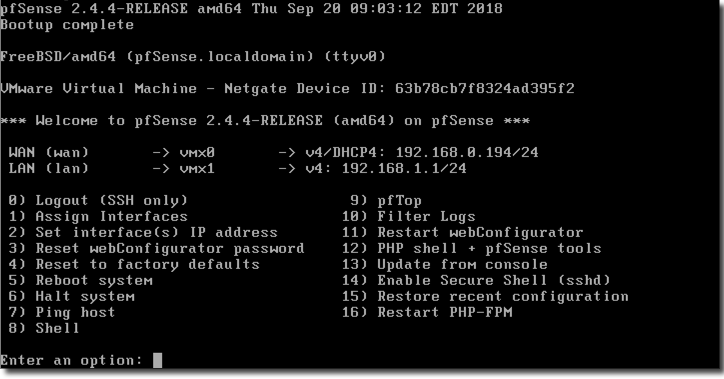 Default credentials are admin / pfsense. Hit Next and step through the wizard to configure such parameters as hostname, domain, DNS, NTP, timezone. Note, on step 4 in the wizard, at the very bottom of the page, uncheck “Block private networks from entering via WAN”. Save and apply the rule. You now have access to the web interface over the WAN interface from the WAN network which in our case is the 192.168.0.0/24 network. Navigate to System -> Package Manager -> Available Packages. Scroll down to, or search for, Open-VM-Tools and install them. Navigate to Interfaces -> VLANs and click Add. 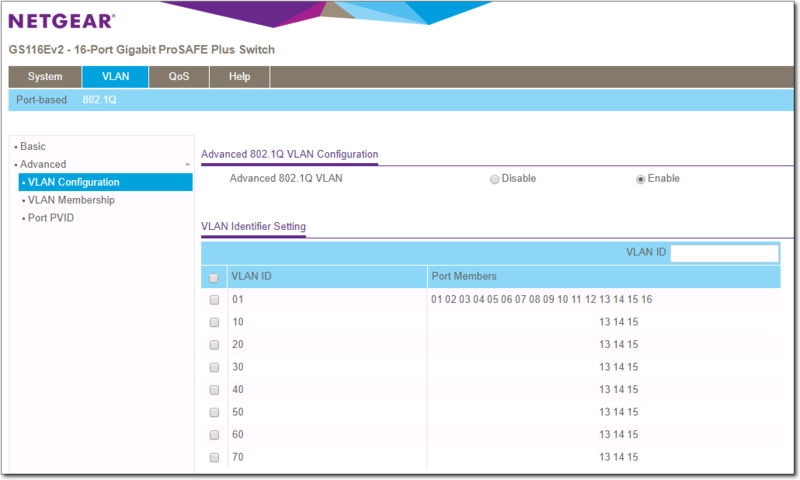 Select vmx1 in the drop down for parent interface, and using the table above, enter 10 for VLAN Tag and Management for Description as seen below. Click Save. Navigate to Interfaces -> Interface Assignments. 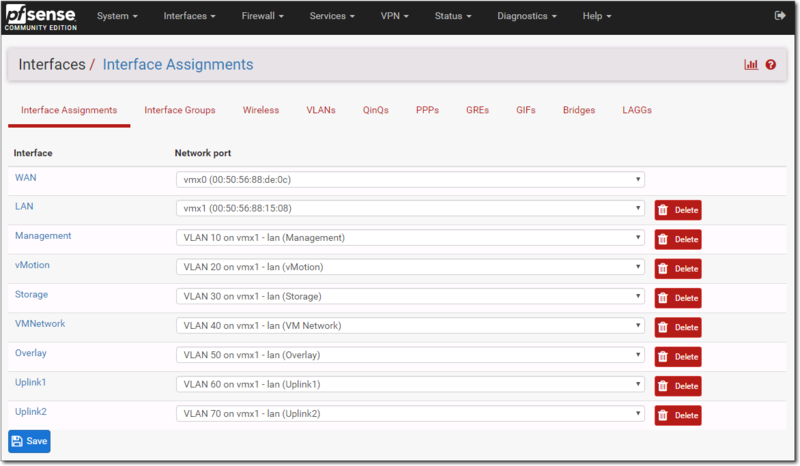 In the Available network ports drop down, select the Management VLAN we just created and click Add. 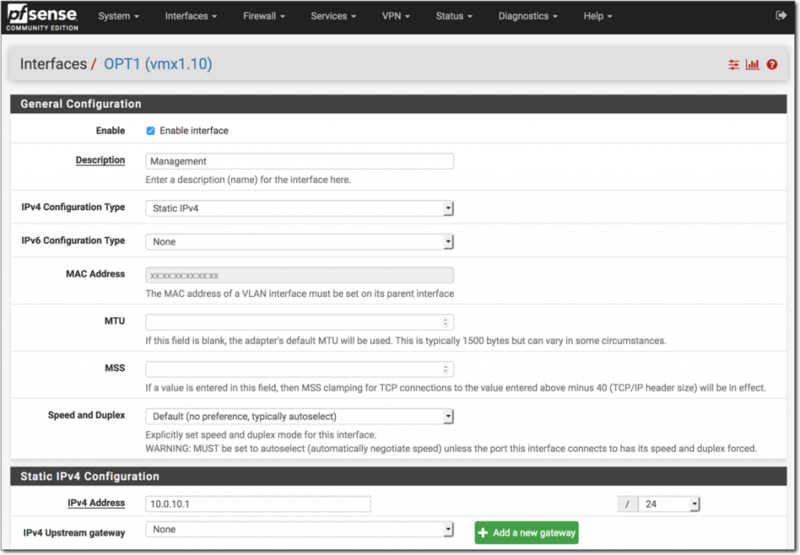 The Management VLAN is now added as an interface called OPT1. Next we need to create firewall rules for each so to allow traffic as by default all traffic is blocked. Navigate to Firewall -> Rules -> Management and click Add. Change Protocol to Any and then click Save followed by Apply Changes.This will result with a rule added like below. Repeat same for each network. That completes today’s post. I appreciate this may be hard to piece all together without a diagram. I will draw up something in the coming days and add it to this or even a previous post. Next post we will deploy the nested ESXi hosts.